Comodo Client Security (CCS) offers complete protection against internal and external threats by combining a powerful antivirus, an enterprise class packet filtering firewall and an advanced host intrusion prevention system called Advanced Protection. When used individually, each of the Antivirus, Firewall, HIPS, Containment, File Rating, Advanced Protection and Website Filtering modules delivers superior protection against their specific threat challenge. When used together they provide a complete 'prevention, detection and cure' security system for your computer. Once installed on a Windows endpoint, CCS can be remotely configured and monitored from the Comodo IT and Security Manager console. The software is designed to be secure 'out of the box' - so even the most inexperienced users need not have to deal with complex configuration issues after installation. 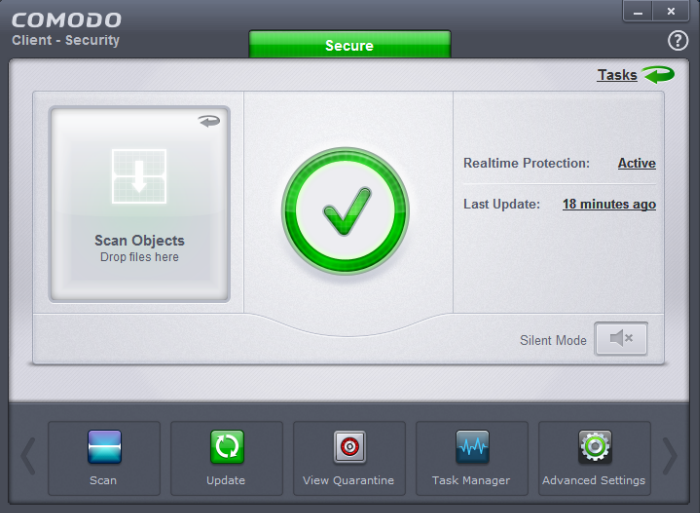 Antivirus - Proactive antivirus engine that automatically detects and eliminates viruses, worms and other malware. Apart from the powerful on-demand, on-access and scheduled scan capabilities, CCS users can now simply drag-and-drop items onto the home screen to run an instant virus scan. Firewall	- Highly configurable packet filtering firewall that constantly defends your system from inbound and outbound Internet attacks. Containment	- Authenticates every executable and process running on your computer and prevents them from taking potentially damaging actions. Unrecognized processes and applications will be automatically run inside a security hardened environment known as a container. Once inside, they will be strictly monitored, will not be able to access other processes and will write to a virtual file system and registry. This gives untrusted (but harmless) applications the freedom to operate while untrusted (and potentially malicious) applications are prevented from damaging your PC or data. Advanced Protection- A collection of prevention based security technologies designed to preserve the integrity, security and privacy of your operating system and user data. Viruscope - Monitors the activities of processes running on your computer and alerts you if they take actions that could potentially threaten your privacy and/or security. Using a system of behavior 'recognizers', Viruscope not only detects unauthorized actions but also allows you to completely undo them. Apart from representing another hi-tech layer of protection against malware, this also provides you with the granular power to reverse unwanted actions taken by legitimate software without blocking the software entirely. Rescue Disk - Built-in wizard that allows you to burn a boot-disk which will run antivirus scans in a pre-Windows / pre-boot environment. Website Filtering	- Protects you from phishing sites while surfing the 'net and allows you to create rules to prevent specific users from accessing certain websites. CCS ships with several preset lists of malicious websites which form an effective website screening and protection feature for all Internet users. Furthermore, you can easily add or import your own lists of banned URLs and can set up custom access rules for each user on your computer. Additional Utilities - The advanced tasks section contains links that allow you to install other, free, Comodo security products - Comodo Cleaning Essentials and KillSwitch. This introduction is intended to provide an overview of the basics of Comodo Client Security and should be of interest to all users. The remaining sections of the guide cover every aspect of the configuration of Comodo Client Security.